In a large skillet over medium heat, saute the onion and bell pepper in olive oil for 5-10 minutes, or until onions are translucent. Shred the chicken from the bones and set aside. Heat a second skillet over medium heat. 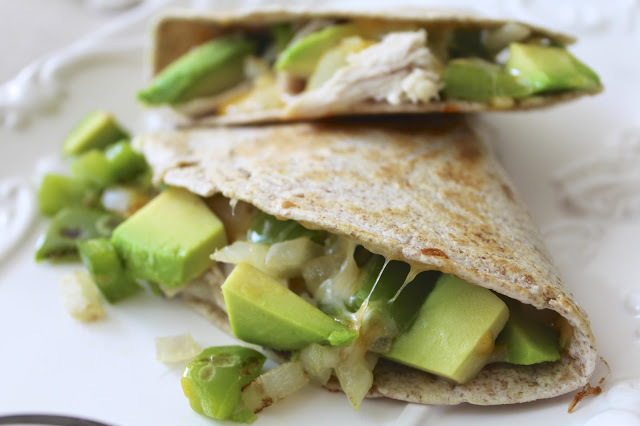 Once hot, place 1 tortilla in the pan and top with cheese, peppers and onions, avocado, and chicken. Fold the tortilla in half. Heat until the tortilla is just browned on each side. Cut in half and serve with lime wedges, salsa, and fresh cilantro!